(Nanowerk News) Montana State University will celebrate nanoscience, the study of extremely small particles, with NanoDays, featuring free and fun family activities, set for 6-8 p.m. Monday, March 29. All NanoDay events take place at the Burns Technology Center's Studio 1080 multimedia center, located in the atrium of the Engineering and Physical Sciences Building just east of the Strand Union at MSU. The activities to help children and adults understand nanoscience open with a lecture by M.G. Finn of the Scripps Research Institute in La Jolla, Calif., on "Bottoms Up: A Toast to Nanotechnology." An open discussion and question and answer period will follow. 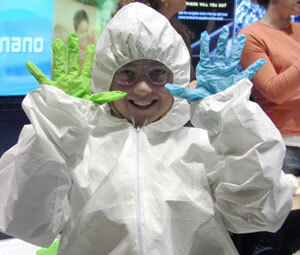 A NanoDays participant learns about nanotechnology by trying on a clean suit, like those worn by scientists. Family activities and hands-on demonstrations are scheduled from 6-8 p.m. Participants can build his or her own virus model, manipulate magnetic liquid, and play with a hydrogen fuel cell model car. Activities are appropriate for children approximately aged 8 and up. Children must be accompanied by an adult. However, children may participate in the hands-on activities while adults listen to the public lecture. The first 100 participants receive a free souvenir. Organizers say that nanoscientists work with particles and devices between one and 100 nanometers in size (the head of a pin is 1 million nanometers across). Through nanoscience, scientists have developed disease-fighting drugs, computer components, transparent sunscreen, ultra-strong sports equipment and many other applications. At MSU, researchers are using nanoscience to develop targeted vaccines, magnetic materials for electronics, and catalysts for producing hydrogen. Nanoscience is an emerging field that blends chemistry, physics, engineering and other areas of science, and is one of the country's top research priorities. NanoDays is sponsored by MSU's Center for Bio-Inspired Nanomaterials, MSU Extended University and the Undergraduate Chemistry Society.